4 wheel carriage and black harness. Horse carriage four wheeler made for competition driving. Ideal for weddings, etc... Sprayed in royal blue with lamps and lamp holders, whip holder and brass furniture. 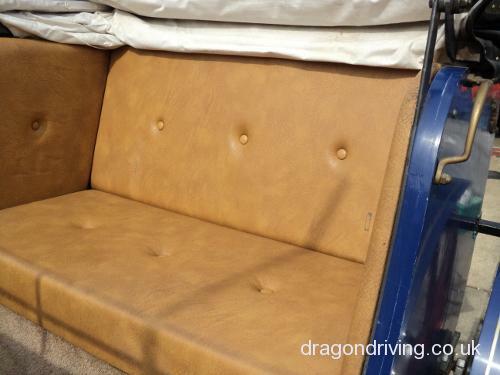 Fully upholstered seats, front and rear, drivers and groom seat, with storage area enclosed under the seat. Rear double upholstered seat, carpet fully fitted. Sides have black folding steps. Wheels carriage style, front and rear with solid rubber rims. Front turn table could possibly be made for a pair. Swan necked shafts, tubular metal, will take up to 15.2hh and possibly bigger. Not heavy to pull or manoeuvre. It has been made on indespention units for comfort. It also has a black, fully lined folding hood at the rear, leatherette type. Length of the body from tyre to tyre over twelve feet, plus the length of the shafts. Ideal business or pleasure use ready for use. Just been stored in an internal garage, we have never used it, only been out of the garage once to take the photo. Mini Victoria, lovely little Victoria carriage, has been used for christenings in the past. Not seen one this small around. Suit up to 12hh. White hearse, has been used with pair and team. Take full size casket. Brand new Lambert style dray built by Coulsons. Swept body,double bent shafts. Bow top open lot living wagon on bull nose wheels. Pull out bed, large pan box, wind on brake. The wagon has had some work done on the turntable in ash. New back axle casing and new ash wooden shafts. The roof sheet is in very good condition and has a good front sheet. No leaks. The top comes off so the dray can be used. Little Scotch dray here for sale, all been newly done up by Jowett, had brand new set of wheels, a brand new lock. Still on original old axles, proper original swan neck springs, all iron work still original, back cradle is original. 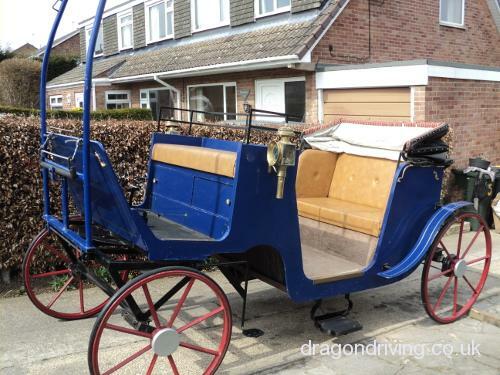 Very rare dray, priced to sell, only for sale as over stocked. Will take harness in px. James Barry Scotch Dray, old fashioned dray that was the milkman's dray years ago in Scarborough. Bent leather shafts and spindle backboard and side pens. Full size dray, will fit cob size 13hh-15hh, excellent condition, one careful owner. 4 years old, used a couple of times only, kept undercover. Ready to go. Solid wood, hand painted to very high standard. Includes pneumatic tyres, back board, pan cupboard. Solid wood underworks and shafts. Brakes. A beautiful dray, excellent quality. Price reflects high quality. Here I have my Bow top wagon which is 8 foot long. As you can see it's on artillery wheels, has all good tyres. Bent shafts. Has a Queenie stove inside with a stainless chimney. Also has a pan box. If you would like any more pictures please ask, thanks, Donna.